Firefighter paramedic Mike Robbins, not only serves our community of Mountain View, California, by risking his life to save others, but he serves up fresh vegetables to his teammates through his love of gardening. 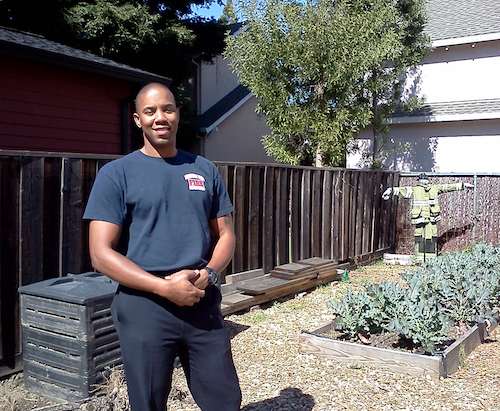 Mike established an edible garden with vegetables and fruit trees at Mountain View Fire Station 1, that not only provides fresh produce for the station's meals together, but he also shares the bounty with the neighbors in his residential location near downtown. I met Mike when he and his fellow fire fighters dropped into the Chez TJ kitchen garden last Spring to chat about our mutual passion for growing food. What a great idea to have an edible garden at a fire station - because as Mike has found, it's also therapeutic and relaxing to work in the garden. For those in stressful jobs, the activity of growing and sharing food together is certainly nurturing, nourishing, and sustaining in many ways. I dropped by the fire house recently to how the garden was coming along and to say hello. Mike had been deployed elsewhere for the day, but I met his crewmates, Joe Worthman and Steve Desirio, both fire fighters and EMTs (paramedics). They were happy to show me the garden, and I even cajoled one of these camera shy heroes, (Joe) into a photo. Apparently the urban legend about all fire fighters being handsome heartthrobs is true, as you can see for yourself in the photo above. Fire fighter Steve Desirio is an avid gardener at his home in San Francisco, where he grows edibles all year-round (in the fog, no less) and even starts his veggies from seed. They both gave abundant credit to Mike by saying that the garden is all his doing. 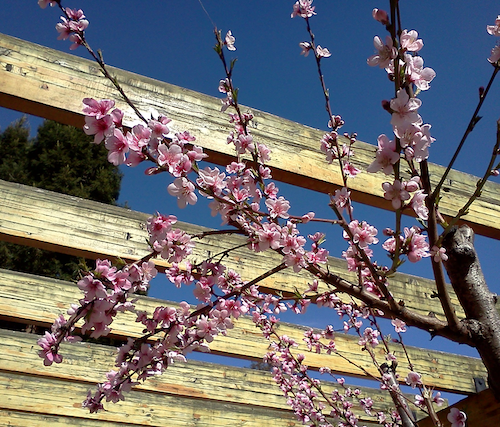 You can read an engaging article about Mike and his garden on California Bountiful Magazine. A big thank you to Mike and his crewmates for their service to our community! Photo: Patricia Larenas, Urban Artichoke.